I didn't plan on reviewing a movie on my blog, but I suppose it makes sense. I watch a lot of movies and while I don't frequently watch documentaries, The Pixar Story was really fascinating and bolstering for me as a writer and community-builder. For the past two years, I've taught gifted education to students in grades 2-8. Each year we choose a theme and many of the lessons and units spring from this theme. This year I decided on "What is CREATIVITY?" All year we have done creative projects, some based on books, and students demonstrate their learning through individual and collaborative products such as posters, dioramas, skits, poems, models, reports, songs and more. The projects are always multidisciplinary in nature. We also talk about how we can look at the world with our "problem solving eyes" and try to find creative solutions that make the world a better place. After watching The Pixar Story, I know I need to show my students this film. These are children who grew up watching Pixar movies. All my 10 year old students have cell phones. They have regular access to computers. Technology is so inherent to their life experiences, it is amazing to see the progress that has been made, technologically speaking, by pushing the boundaries of both art and computer science. What I found to be most impressive and inspiring ends up being the key to Pixar's success. Time and time again, they make hit movies. For a while, Disney thought this success was because of the 3D animation, even (sadly) shutting down production for a while on 2D animated films. But really, when you boil it down, these are just good stories. Well-developed characters, inventive, imaginative worlds. New stories! Timeless themes like friendship, love, fear, growing up, change and hope. The driving force behind the first few films, including the Toy Story movies, was Pixar animator and now Chief Creative Officer, John Lasseter. I love watching someone who is passionate discuss their story. This is someone who loves animation, loves storytelling. His nature really infected the entire culture at Pixar, which is very open and creative, often encouraging unplanned creative collaborations. 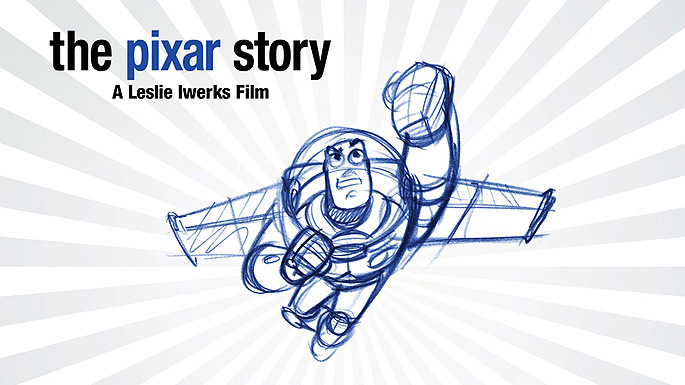 These collaborations prove to be the life-sustaining force for Pixar. Ideas stay fresh. They are always up for a new challenge. These people love what they do and love the stories they tell. I love intersections. After dating a few people in computer science, I am aware of how creative the field can be, though I'm not sure if that is the public perception. The movie really demonstrates the intersections between math, art, computer science, and writing. My one gripe is that the film mostly featured men. The first woman featured in the film was John Lasseter's assistant. The second is a producer and the third is Lasseter's wife. I also realized that none of Pixar's films have central female protagonist. Apparently they are working to remedy this with their 13th movie Brave. It was also be directed by Pixar's first female director, Brenda Chapman. However, I'm a little irked because the character is a princess. Really? Come on, Pixar. I would have expected more from you. Why couldn't you make a female character that was a motocross racer or a sloth with magical powers? Or (gasp!) just a regular kid! *sigh* Then again, does WALL-E really have a gender? I mean, clearly they try to gender the characters, especially EVE, but that is us assuming their genders based on their behavior, which isn't the same thing. Though, I can't fault Pixar too much because honestly Hollywood is about as misogynistic as you can get. Gender bias aside, the documentary is entertaining and inspiring for creative people from a variety of fields. As a writer, it's great to know that even with this multimillion dollar medium, a good story is what prevails. I'll be interested to see how my students respond to the film. I've come up with some questions for them to answer as they watch and then we will work on some group projects, hopefully with Pixar's spirit of creative collaboration fresh in our minds.